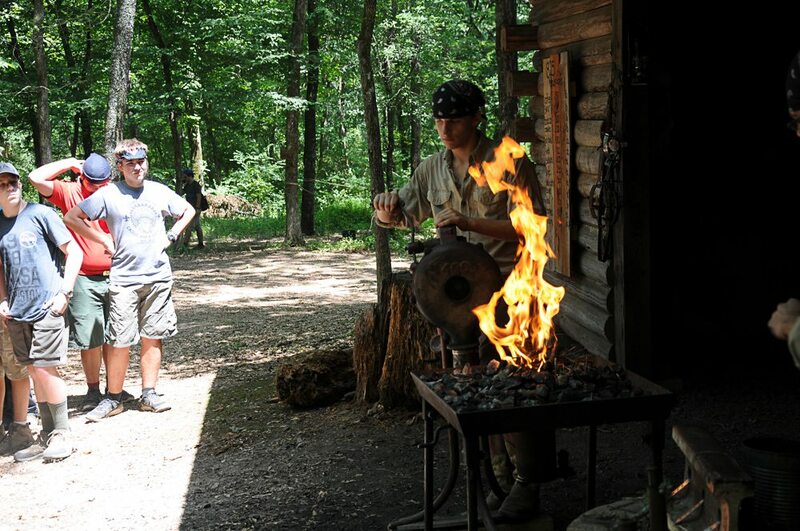 The Camp Pioneer Mountain Man program is intended to give Scouts and Leaders an opportunity to see what life was like in the days of the Pioneers, who fought to survive in places like Camp Pioneer before they became “civilized”. Our program is designed to pass on the skills that were necessary during that time of our history. Although parts of some merit badges can be completed, through various activities, the Mountain Man activity is not designed to be a merit badge program. A Scout must be at least 13 years old by June 1st of the current year, a First Class Scout and a third year camper. Adult leaders are welcome to participate as well. An extra fee of $15.00 will be charged to participants to cover the cost of materials and patch. Leaders are encouraged to participate in this program and also will be charged the extra fee of $15.00. Please have all participants registered through the Council Service Center by May 15th. The program will be canceled any given week if a minimum of 5 participants does not register. Participants who complete all of the Mountain Man requirements will earn a special Mountain Man patch. Program instructors will keep a record as participants complete requirements. The special patch is awarded for completion of the program, not just for paying the fee and showing up part of the time.